will be missed by social media addicts and insecure teenagers alike. Advertisement is one of the driving reasons why many users (young people in particular) are abandoning the platform. As the site becomes more ad-ridden, and more parents, family or even police show up on the site, usership among young people is likely to decrease. People still want social media though. So where is everyone going? Teens and young adults don’t want Mum commenting on their status. They don’t want the mundane updates they see and hear everyday at school. They don’t want ads. Instead, they’d rather be expressing themselves through photos or videos without the clutter of ads and annoyance from their parents… and Twitter provides this. Also, Facebook just isn’t cool anymore. People just follow the social norm. You’re told “nobody uses Facebook anymore; it’s all about twitter now!” You have seen no evidence of this yourself: you enjoy Facebook, and it has everything you could want in a social media website… But of course you are going to convert to twitter anyway, ‘cause your mate told you to and you wouldn’t want to run the risk of looking uncool now, would you? Not dead, but slowly dying? 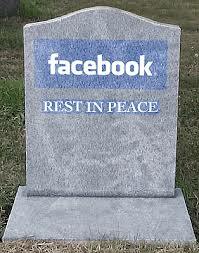 With a user base of a cool 1 billion+, Facebook will not be obsolete anytime in the near future. With all the data it has of its users, its advantage is the ability to target ads better than other micro-blogs and social networks – making it effective and profitable despite losing the cool kids to Snapchat and Twitter. For now, Facebook profiles will remain despite the inactivity… But with things like Snapchat, Twitter and Tumblr popping up all the time: for how much longer, I do not know.